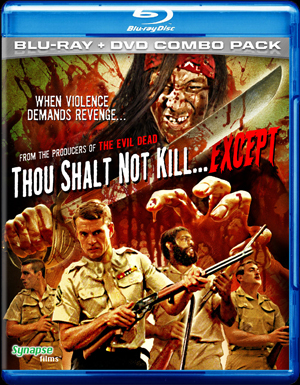 Synapse Films is proud to present THOU SHALT NOT KILL… EXCEPT in an all-new 2K high-definition transfer from the original negative. Directed by Josh Becker, this “must-see” (Detroit Free Press) cult classic features many of the people responsible for THE EVIL DEAD, including co-writer Bruce Campbell, writer/producer Scott Spiegel, composer Joseph LoDuca, and actor Ted Raimi. The Original Super 8mm Short film, STRYKER’S WAR Short Film, starring Bruce Campbell!